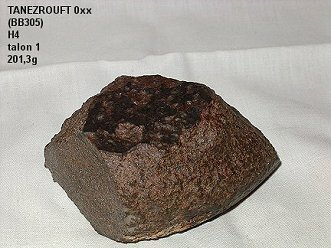 Remarks : Fresh meteorite (W1) rich in metal. 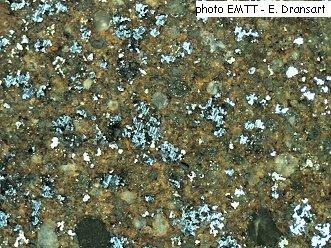 Beautiful chondrules sharply defined in the porous matrix (20% porosity). 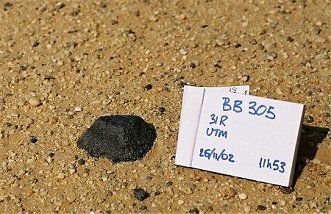 BB 305 was first included in the provisional issue of MB 88 in April 2004, and then removed from the final issue because the weight of the types pecimen is lower than 20g after the losses caused by the analyses preparations. 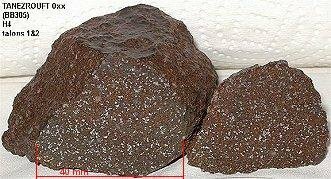 As the main mass was sold already, it has not been possible for us to add the missing mass to the type specimen. But the above classification is valid. View of the two end pieces after cutting the 222 g main fragment. 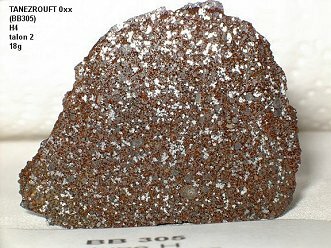 Native metal flakes are very abundant.